When the Confederate States of America fired on Fort Sumter on April 12, 1861, Norway was a prosperous and growing town of 1982 inhabitants. Norway sent down to the war more than a third of its adult male population. Maine furnished thirty-two regiments for the war and the commanding officer for three of the regiments came from Norway. There were five Lieutenants, and ten Captains from Norway, with a total of 44 different commissions in all. Norway had one Brigadier-Genereal, two brevet Brigadier Generals, one brevet Major General, three Colonels, one Chaplain, one Assistant Surgeon and one Regimental Quartermaster. No citizen of Norway enlisted either in the Cavalry or Light Artillery. All but two enlisted in the Infantry. These two enlisted in Heavy Artillery. One of the very first soldiers to give his life in the Civil War was Sumner Henry Needham. He was born in Norway, but had moved to Lowell, Massachusetts. He was a member of the 6th Massachusetts Regiment. He was killed by a mob as the regiment was passing through Baltimore. Forty-four gave their lives for the cause. Ten of them fell in battle and seven more died from wounds received in action. Twenty-seven died from disease incident to military life. Three Norway soldiers ready to leave for war in April 1861. 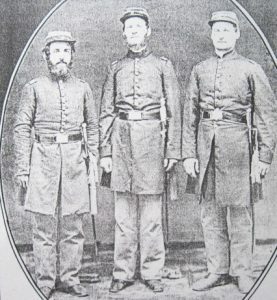 L to R: Second Lieutenant Harry Rust, Captain George L. Beal, later promoted to General, First Lieutenant Jonathan Blake. George L. Beal, Co G, 1st Regt. Colonel of Co G, in the 10th Maine Regt. Jonathan Blake, Co G, 1st Regt. Captain of Co G, in the 10th Maine Regt. Caleb C. Buck, Co G, 1st Regt. William F. Cox, Co H, 23rd Maine, Co B, 32nd Maine. Taken prisoner. Discharged and later joined Co F, Maine Coast Guards. Isaac C. Cross, Co I, 5th Maine Regt. Charles W. Dinsmore, Co G, 10th Maine, transferred to 10th Maine Battalion, then to Co D, 29th Maine. Taken prisoner. Claudius M. Favor, Sgt. in Co G, 1st Maine Co, 29th Maine. Later served as 2nd Lt in Captain Cobb’s Company at Fort McClary. J. Frank Hobbs, Co G, 1st Maine; Co G, 14th Maine. Discharged as Captain. William D. Merrill, Co F, 17th Maine; transferred to Veteran Reserve Corps. Amos F. Noyes, 1st Lt., Co G, 14th Maine; Capt., Co H, 14th Maine; Capt., Co B, 32nd Maine. During the summer of 1864 he commanded the 32nd Regt. Charles Thompson, Co G, 1st Maine, 10th Maine Regimental Commissary Sergeant promoted to Quartermaster. Quartermaster of 29th Maine Regt. 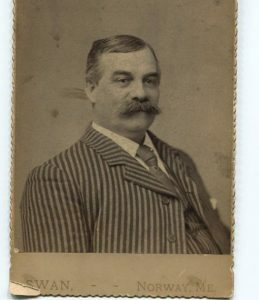 William W. Virgin, Colonel of 23rd Regt. The company was enlisted for sixty days, it was mustered April 27th, 1864 and discharged 9 July 1864. 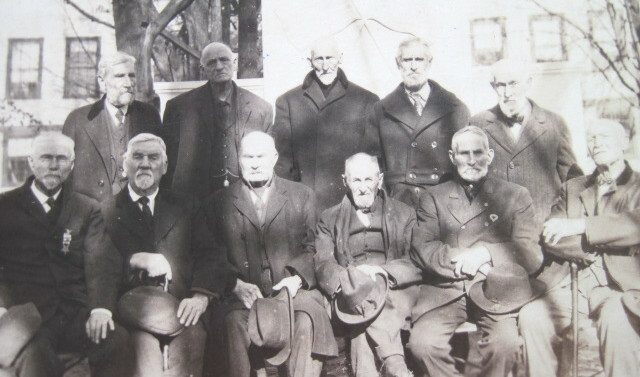 Benjamin G. Barrows, James G. B. Bradbury, Sylvanus Cobb Jr., George A. Cole, Charles B. Cummings, Arthur E. Denison, James C. Drew, William D. Earle Charles J. Edgecomb, Claudius M. Favor, James M. Favor, Edwin Fisher, Wallace Foster, William E. Frost, Atwood Gammon, Abram Green, Andrew P. Greenleaf, Frank H. Hamlin, Joseph F. Herrick, Levi E. Holden, George F. Howe, George F. Leonard, Charles M. Mallett, Hiram Merrill, William A. Merrill, William F. Merrill, Charles F. Millett, Edwin J. Newhall, Benjamin H. Noble, Scott Partridge, Charles S. Penley, Isaiah V. Penley, Frank H. Reed, Oliver Shackley, Clarence M. Smith, Edward F. Stevens, Henry Tucker, John Tucker, and Rodolphus Young. Stidman Bennett, Wagoner in 1st Massachusetts Regt., died at Mt Pleasant Hospital. E. Wright Bisbee was promoted to Capt. of his company in a Massachusetts regiment. Aaron W. Brown served in a Massachusetts regiment and died at Falmouth, Virginia. William A. Evans of the 28th Massachusetts was killed at Spottsylvania. James L. Merrill, Sergeant in the U. S. Signal Corps. Died at Norfolk, Virginia. Other Norway men who served in Massachusetts regiments were Henry O. Beal, Henry T. Merrill, James Merrill, Joseph H. Newhall, Charles E. Newhall, and Charles A. Smith. Stephen C. Yeaton served in the 54th Massachusetts Regiment. Daniel S. Morse enlisted in the regular army and Daniel Latham, George F. Latham, and J. C. Davis served in the United States Navy. First Maine Regiment of Volunteers – Company G. Used to defend Washington, D.C. during the First Battle of Bull Run. Fifth Maine Regiment of Volunteers – Company G (This was one of the regiments in The Army of the Potomac). Mustered into service 4 June 1861. First Battle of Bull Run, Peninsular Campaign, Antietam, Fredericksburg, Chancellorsville, Gettysburg, Wilderness, Cold Harbor, North Anna River. Ninth Maine Regiment of Volunteers – Mustered into service 21 September 1861. Service was mostly given in the south; South Carolina, Battle of Cold Harbor, Petersburg. Thirteenth Maine Regiment of Volunteers – One Norway officer, Colonel Henry Rust Jr. was the commanding officer. Tenth Maine Regiment of Volunteers – Most of the men whose duty terminated in the First Maine enlisted to serve in this new regiment. Sent to guard and inspect railroad cars and lines on the Baltimore and Ohio Railroad. Reconnaissance duties – Luray Court House, Sandy Hook, Flint Hill,Warrenton, Battle of Cedar Mountain, Second Battle of Bull Run, Antietam, Guard duty at Maryland Heights. Mustered out of service 8 May 1863. 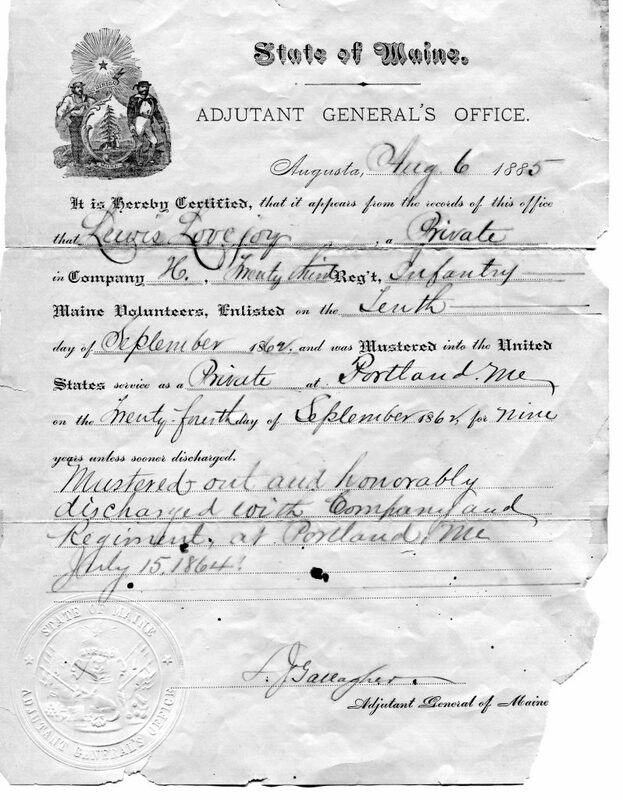 Seventeenth Maine Regiment of Maine Volunteers – Companies F and C. Mustered into service 18 August 1862. Battles of Fredericksburg, Chancellorsville, Gettysburg (second day’s Battle), Wapping Heights (in pursuit of General Robert E. Lee), Locust Grove, Mene Run. These battles and campaigns were carried on in connection with the Third Army Corps. The Third and Second Army corps were then consolidated, to be known as the Second Army corps. Wilderness, North Anna River, Petersburg, Spottsylvania Court House, Cold Harbor, Richmond. The Seventeenth Maine then returned to Washington, D.C. for the Grand Review at the end of the war. Eighteenth Maine Regiment of Volunteers (Became the First Maine Heavy Artillery) – Defense of Washington, Spottsylvania Court House. After Spottsylvania Court House the regiment became part of the Second Army Corps. Twenty-Third Maine Regiment of Volunteers – William W. Virgin, commanding officer – Company H. Mustered into service 29 September 1862. Duty: Guard the crossings of the Potomac. Engaged in no major skirmishes. Missed involvment in Battle of Gettysburg, because their enlistments were up on the 27th of June. Twenty-ninth Maine Regiment of Volunteers – Company G. The commanding officer of the 29th Regiment was General George L. Beal. Sabine Cross Roads, Battle of Fisher’s Hill, Battle of Cedar Creek, Battle of Opequan. Regiment took part in the final Grand Review. Later ordered to the south to assist in administration of military government and Freedmans Bereau. General Beal was military governor of the South Carolina Military District. Thirty-first Regiment – Company B took part in the capture of Petersburg and took pursuit of the Rebel Army. Mustered out of service 15 July 1865. Thirty-second Maine Regiment of Maine Volunteers – Mustered into service in February 1864. This was the last regiment raised for service in Maine. Most Norway men served in Company B. The regiment was held in reserve during the Battle of the Wilderness and Cold Harbor. Because of the large numbers of casualties suffered at Fort Hell (Battle of Petersburg) the Thirty-second was consolidated with the Thirty-first Maine Regiment. Thanks to Ben Tucker, III for providing this article.